How Bad Are K-Cups for the Environment? “I don’t have one. They’re kind of expensive to use,” John Sylvan told me frankly, of Keurig K-Cups, the single-serve brewing pods that have fundamentally changed the coffee experience in recent years. “Plus it’s not like drip coffee is tough to make.” Which would seem like a pretty banal sentiment, were Sylvan not the inventor of the K-Cup.Almost one in three American homes now has a pod-based coffee machine, even though Sylvan never imagined they would be used outside of offices. Last year K-Cups accounted for most of Keurig Green Mountain’s $4.7 billion in revenue—more than five times what the company made five years prior. So even though he gets treated like a minor celebrity when he tells people he founded Keurig, Sylvan has some regrets about selling his share of the company in 1997 for $50,000. But that’s not what really upsets him. As a twenty-something Bostonian in 1992, John Sylvan didn’t have a particular passion for coffee. But he was drinking 30 to 40 cups a day. He had to drink that much because, intent on starting his own business, Sylvan had left his menial office job and become his own test subject for coffee—which was at times barely palatable—that he could produce via a homemade pod device.Sylvan was certain there was a market for a better, more customizable, more liberating caffeine experience than the tepid office percolator, run by vendors with a corner on the market for delivering terrible coffee en masse. Once he had a design that worked, he looked up the word excellence in Dutch—because “everyone likes the Dutch”—and he and his college roommate Peter Dragone named their new company Keurig.Sylvan knew the pods would sell. As he explains the appeal now, “It’s like a cigarette for coffee, a single-serve delivery mechanism for an addictive substance.” But he had no idea at the time how ubiquitous the product would become. And like printer cartridges or razor blades, the Keurig business model was predicated on another type of dependence. The machines are not too expensive as appliances go. You can get one for $63; a bargain for a taste of the good stuff. But once you have one, it has you, too. The cups contain a mere 11 grams of ground coffee, vacuum-sealed in nitrogen to prevent oxidation. K-Cups are extremely profitable, selling standard coffee grounds for around $40 per pound. But what are you going to do, not buy the refills for your machine? And when the pertinent K-Cup design patents expired in 2012, and the market was suddenly flooded with off-brand competitors, the company created a second-generation (2.0) machine that would only function with Keurig-brand cups. It’s digital rights management, the coffee equivalent of Steve Jobs’ attempt to fill iPods only with music sold through iTunes. That might seem like a reasonable, defensible move to protect intellectual property and keep a corner on the market—except that some of the competitors’ cups are nearly completely biodegradable or reusable. Which does little to deflect the growing criticism that Keurig Green Mountain is not seriously prioritizing sustainability. “Watch this. Oh my.” Sylvan sent me a link to a YouTube video entitled “Kill the K-Cup.” It was an apocalyptic two-and-a-half minutes of K-Cups raining down on humanity like hellfire. Flying monsters and aircrafts made entirely of K-Cups shoot K-Cups down onto people cowering in the streets, which are filled with empty K-Cups. The video was highly produced, with Hollywood-level,Cloverfield-esque special effects and disdain for subtlety: K-Cups are quite literally destroying the planet. The implicit scale of the tragedy is enormous, even if we only see two people actually crushed by K-Cups.The doomsday sequences are interspersed with statistics that drive the point home: In 2014, enough K-Cups were sold that if placed end-to-end, they would circle the globe 10.5 times. Almost all of them ended up in landfills. They are not recyclable. Using them is extremely wasteful and irresponsible; they are a stupid way to make coffee that simply cannot be sustained. Stop using them, stop using them, stop using them; “Kill the K-Cup, before it kills our planet.Like many users of the Internet, I had actually already seen “Kill the K-Cup.” The mysteriously anonymous YouTube video was published this January, and spread widely. It spawned a hashtag #KillTheKCup (at the suggestion of the final frames of the video), which is still alive on multiple social-media platforms. Imitators have posted videos of themselves throwing their Keurig machines out of windows or bashing them with baseball bats, Office Space style. The “Kill the K-Cup” video was the most popular post on the environmental website Grist for multiple days. I asked the author of the post at the time if she knew the origin of the video; she didn’t. It was relatable enough that it got picked up on news sites even before journalists knew where it came from. It seemed like a strangely high-investment approach to video production, especially for something that no one bothered to take credit for. Except then, of course, someone eventually did. * * *Keurig Green Mountain is secretive about how many K-Cups the company actually puts into the world every year. The best estimates say the Keurig pods buried in 2014 would actually circle the Earth not 10.5 times, but more than 12. The company would only tell me that last year they sold 9.8 billion Keurig-brewed portion packs—which include the new multiple-cup pods.“Those are fully recyclable,” Monique Oxender is quick to point out. Oxender came to Keurig Green Mountain in 2012 to serve as Chief Sustainability Officer. Green Mountain, a company long known for eco-friendly approaches to coffee, acquired Keurig in 2006, even though the company did not change its name to “Keurig Green Mountain” until March of 2014. And indeed, every new K-Cup spin-off product that the company has introduced since 2006 (including the Vue, Bolt, and K-Carafe cups) is recyclable, if a person is willing to disassemble them into paper, plastic, and metal components.“I gotta be honest with you,” Oxender said, “we’re not happy with where we are either. We have to get a solution, and we have to get it in place quickly.”Last year, Keurig Green Mountain pledged to create a fully recyclable version of its blockbuster product, the K-Cup, by 2020. Last month the company’s annual sustainability report reaffirmed that vow. It’s a point that Oxender has reiterated multiple times during damage control in the wake of #KillTheKCup. But promising only five more years with this amount of waste has done little to satisfy detractors. Some say it won’t be possible, ever, to make a K-Cup that is anything short of an environmental shitstorm. Hachey has six brand-new coffee presses sitting on his desk. Hachey and colleagues were embattled every time they finished making a cup. “We didn’t like having these little pods that we couldn’t just easily open up, compost the grounds, and recycle the plastic,” he explained. Even for the employees who were willing to take the time to separate the lid, remove the paper filter, and compost the grounds, the local recycling facilities were struggling with the cups falling through sorting grates.“We work in advertising; we work with brands to help tell their stories, including social-media campaigns that require engaging content,” Hachey explained. “So we thought, you know what, we can take on a cause and really make something that would be passable.”I laughed, a little. Passable?“You know, something that people would watch and want to pass on, like a viral video.”(In the U.S. people tend to say shareable, but that’s also an awful buzzword cliché, so maybe passable should take its place? It works on another level, too, because so much shareable content is held only to the editorial and intellectual standard of being passable. )It became clear to Hachey that in order for a video to be extremely passable, it needed to do something people would care about. Marrying that with satire and pop-culture seemed like a clear formula for success. Plus his company wanted an exercise in post-production. “What we ended up with was this short movie where we’re exaggerating the impact of K-Cups on the planet,” he explained. That movie was, of course, “Kill the K-Cups.”Keeping the video anonymous was only part of Egg Studios’ strategy to create buzz on social media, which led to some news write-ups. After the first week, Egg Studios sent out a press release claiming ownership of the video, and Hachey did some subsequent radio and TV interviews. He even talked with a Singapore newspaper. (There are no Keurig machines in Singapore.) The Edmonton Waste Management Centre called the studio to say they had found that coffee pods account for fully one percent of their waste. Hachey has six brand-new coffee presses sitting on his desk, unsolicited gifts from companies that appreciated the video, one signed “P.S. We hate K-cups, too.”I asked if he heard from Keurig Green Mountain. “They said they liked the video and thought it was funny, and they appreciate the point we’re trying to make,” Hachey said. “Do you believe that?”“I think they’re pretty pissed off about the video,” he admitted. “As a corporation, you can no longer just sit in your office and hope that no one comes and pickets in front of your door. Now we do the same thing through content that can have an even bigger impact on bottom lines.”One of the most famous cases of consumer empowerment through viral videos was 2009’s “United Breaks Guitars,” in which musician Dave Carroll sang about how United Airlines broke his Taylor guitar and denied claims for reimbursement. Shortly after the video swept the Internet, United stock fell dramatically. One analyst estimated that the incident ultimately cost shareholders $180 million. The video has now been seen 15 million times on YouTube. For that kind of exposure, I imagine many aspiring musicians would be willing to watch their guitars get broken.At KillTheKCup.org, people can sign a petition that asks Keurig to improve its product. But really, the hashtag is the petition. “We hoped that people would try to take on the cause with us,” he said. Maybe just by giving up K-cups, or by using the refillable cups that worked with the first version of the machine. And, of course, maybe even spreading the hashtag and bringing more people back to the work of Egg Studios.For the small production company, Kill the K-Cups was both a talent showcase and a way to make an impact. Prior to this video, Egg’s most popular project was some high-concept pro-bono work for the pregame show of the local junior hockey team, the Halifax Mooseheads. (Which is more amazing than it might sound.) But in a media landscape increasingly saturated with amazing-ness, social impact is the surest way to stand out. Environmental awareness is never a bad thing, but how warranted is the fear and outrage that these pods have spawned? And if the little cups are so bad, what is the best way for a reasonable person to acquire coffee? To get that taste of liveliness, and, for at least one moment each day, feel uniquely lucid and ambitious, even excited about work, without the creeping guilt that you and your habit are but little drags on this majestic planet? Does it? 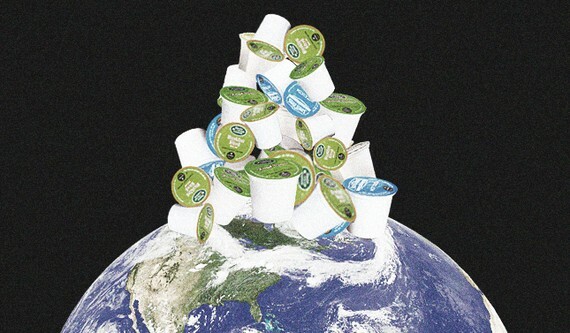 The statistic in Kill the K-Cups about the pods circling the earth 10.5 times is now widely cited. The dramatic imagery came from a popular 2014Mother Jones article by Maddie Oatman—which has now been passed 95,000 times on Facebook. That article borrowed the statistic from a book calledCaffeinated, which was written by none other than Murray Carpenter, the journalist who initially raised the concern about K-Cups in the Times in 2010. When I spoke with Carpenter, he acknowledged that the problem is actually not as straightforward as the earth-circling cups and the “Most Wasteful Form of Coffee There Is” headlines make it seem. As consumers, we have visceral reactions to the waste that we actually see being produced, the piles of pods that we watch accumulate in trash bins. But in other ways unseen, Keurig’s method isn’t the worst. Commercial brewing at places like Starbucks is efficient in that way, except that many people use a new cup every time they go, and recycling rates are less than perfect. There is also the energy cost of transportation to and from said Starbucks. Thinking about all of this has been almost enough to make me feel like every coffee method is so far from perfect that I should just give up entirely.Carpenter pointed me to one life-cycle analysis that found the most sustainable approach to daily coffee was actually, yep, instant coffee. And it’s unlikely that many people will switch to instant, or abandon coffee altogether in favor of caffeine pills or energy drinks—which usually also contain excessive sugar, and where much of caffeine is synthetically produced in Chinese factories that Carpenter has described as “sketchy.” So the demand for a quick, easy, customizable, single-serve delivery mechanism will march on.Keurig has said it was at work on a solution to the waste problem since back in 2010 when Carpenter first visited. If pod backlash continues at its current pace, it does seem that the company will need to quickly innovate, ally, or be displaced. Oxender says the most promising redesign approach involves polypropylene. When considering the potential sustainability of a new material, the company has to think about the entire life cycle, including how many material processing facilities have the technology to accommodate the material and bin it appropriately, and whether there will be a buyer at the back door of the recycling centers. Without that, the recyclers aren’t incentivized to collect it. And beyond reconsidering materials, one solution for Keurig might lie with an old friend.“I told them how to improve it, but they don’t want to listen,” John Sylvan told me. “There’s a much better way of doing it.” He paused.I asked if he would tell me what that was.“Sure. Take coffee and put it in a centrifuge, and it comes apart. Then you take the parts and combine them back when you make the coffee. So you could use something like a ketchup foil pack, and the separate parts won’t become oxidized when they’re stored and transported. Then you can combine them again at the last minute while making the coffee,” he said. I couldn’t think of a reason it wouldn’t work, or a reason that it would. After another pause, he said definitively, “I did the experiment years ago, and it worked.”Disruptors, it seems, gonna disrupt. Amazing as it would be if Sylvan were about to capitalize on that and upend the company that once bought him out, he is doing okay either way. When he was bought out of Keurig in 2007 1997, he turned around and bought stock in Green Mountain for $3.20 per share. He sold the stock a couple years ago when it broke $140. He also recently started a new company that sells solar panels, partly to atone for the environmental problem he believes he created. The company is called Zonbak, which means “sun bucket,” in Dutch. —James Hamblin, MD, is a senior editor at The Atlantic.